The matrix stamper is very strange as the SRNN 7001 A - 2U is really stamped as in US or European matrix, not scratched in as in normal Jamaican matrix. The rest is scratched in. Does anybody know the story of this strange matrix, I never saw something similar from Jamaica. 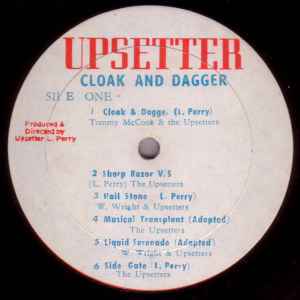 This is the original Jamaican version of Cloak and Dagger, as opposed to the more frequently encountered UK version for which Perry pitched up the tapes to speed it up and make it more appealing to the skinheads. The mixes on this original are far more experimental, proto-dub, as pointed out in Lloyd Bradley's Bass Culture. (Bradley also relates the wonderful tale that some Jamaican schoolkids managed to jam the broadcast frequency of Radio Jamaica with this album, blocking the polite calypso the station was broadcasting). I heard the UK version first and still enjoy the fact that it is reggae sped up to ska tempos, but the innovative Perry is here on this original. This Earmark version is a great pressing and worth tracking down. Does anyone know if this version came before or after the U.K. Rhino version? Would be interesting to find out what sources they used in any case. Accelerated music on both sides . Avoid this reissue. Beware of recent Orchid repress. This version, with the blue, yellow and green cover and the green-yellow labels was released some time prior to the version with the red, yellow and green cover and the all yellow labels . This version, with the red, yellow and green cover and the all yellow labels was released some time after the version with the blue, yellow and green cover and the green-yellow labels.